David H. McConnell did not set out to begin a perfume company. He started out as a book salesman who gave perfume samples to women to get them to take a look at his books. When he found that they were more interested in the perfume than in the books, he decided he was onto something that could be a better money maker. The company he created was not called AVON in the beginning, but rather The California Perfume Company, although it was not located in California. If you are interested in learning more, click on the pic for the whole story. The first "AVON" lady (called a depot agent then) was Mrs. P.F.E. Albee, and AVON representatives receive an award called a "Mrs. Albee" each year when they reach a certain level of award sales, currently $10,000. It is always exciting to see the Mrs. Albee we will be reaching for each year. 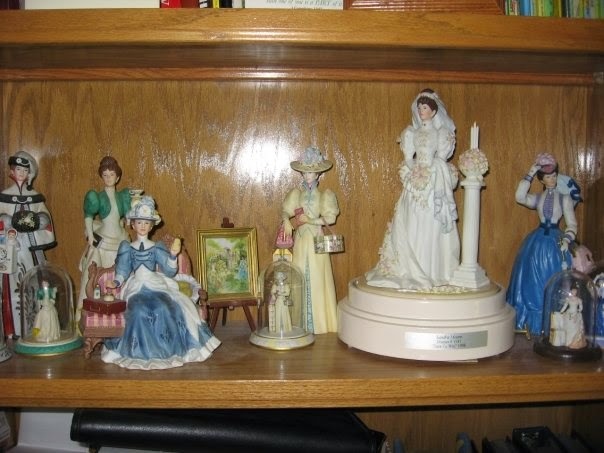 Here is a picture of a few of the Mrs. Albees that I have received through the years, including my first one in 1992, which is the lady in blue who is sitting down. I have been blessed, through the orders of faithful customers, to have received one every year since 1992, bringing my total collection to 24. The bride Mrs. Albee who appears in this picture rotates on a music box and was given as a special award for sales increase in 1998. I often use her as a decoration at wedding showers for which my church shower team is in charge. The miniature Mrs. Albees were given as gifts several years to those who attended the tribute luncheon that all recipients of Mrs. Albees are invited to each year. We are always treated with special honor at those luncheons, and I'm definitely looking forward to the next one, which is coming up on February 19! This is interesting, and you've turned out to be quite a Mrs. Albee collector. Also good info in the how long to keep your makeup blog.